Prospect Hill Junior School bags £4,000 from Tesco’s community grant scheme. . Prospect Hill Junior School is delighted to announce it has bagged £4,000 from Tesco’s Bags of Help community grant scheme. Bags of Help is run in partnership with environmental charity Groundwork, and sees grants awarded to thousands of local community projects every year. Since launching in 2015, it’s provided more than £71 million to over 23,000 local community projects. 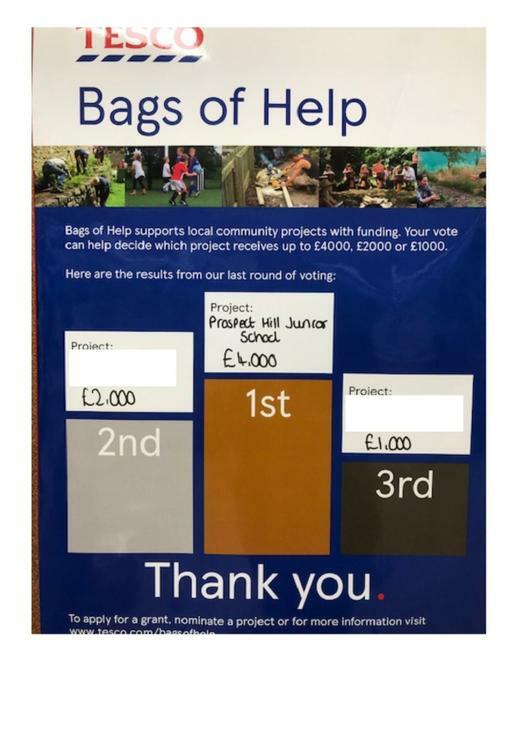 Millions of shoppers have voted in Tesco stores up and down the country and it can now be revealed Prospect Hill Junior School has been awarded £4,000. “Saving Lives – Defibrillator for the Community and Emergency First Aid Training for Pupils & Community”. In addition, to mark Tesco’s 100th year, they have announced two special voting rounds, Tesco Bags of Help Centenary Grants, in summer and winter 2019 with larger grant amounts available over wider geographic regions. Please look online for more information on if they can support your group either through the normal Bags of Help vote or Tesco Bags of Help Centenary Grants.